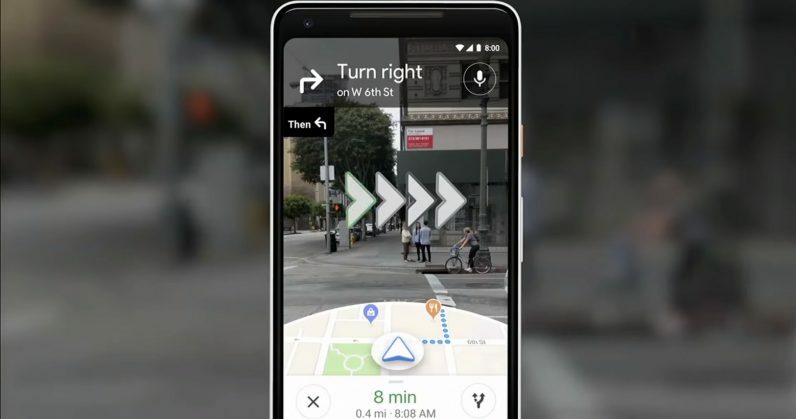 In March this year, Google started rolling out an alpha version of its AR-based navigation feature to a small number of Maps users in select cities. It looked like an awesome solution for travelers and people walking to unfamiliar destinations in bustling towns. After testing out the feature briefly in Hong Kong last month, I was hoping to try it out back home in India, where reaching your destination even with Google Maps‘ help can be difficult, because many cities here are congested and have complex street systems. But since Street View doesn’t cover India, I wasn’t sure the feature will land up here anytime soon. However, to my surprise, the AR feature popped up on Maps last week here in New Delhi, the country’s capital. Before I tell you about how well it worked, keep in mind that the feature is still in alpha stage, so there’s bound to be some bugs. I used the feature en route to a clinic from my home which was roughly 1.5 km away. I used the AR mode for more than half of the time of my journey, but later switched to regular navigation as the road was straight forward, and the feature wasn’t super functional. The AR mode often failed to recognize the surroundings and asked me to try again repeatedly, which gets frustrating after a while. But there was a stretch where the feature worked well, and showed me that I had to take a right turn after 50 meters. Here’s a clip of that. As it is now, you definitely can’t rely on the AR feature to get you to where you’re going — but it does give you a glimpse into what the future of navigation holds. Once the final version of this feature rolls out, I wouldn’t be surprised if it would become the go-to tool for people who’re new to the city. Google Maps often uses street names while navigating, but it’s naive to assume that the person using it would know all the street names; AR mode can be really handy in this case. The company has made no official announcement as to when this feature will roll out to the masses, but hopefully, we’ll get some updates on it at Google’s developer conference in May. I’ve often spent hours walking in circles in unfamiliar cities as I couldn’t understand the direction Google Maps was pointing to. Hopefully, with this new AR mode, it’ll save me from looking like a dumb tourist during my travels.